本发明提供了一种多元配方组合的生物燃油及其制备方法，基于100重量份，包括甲醇改性复合体不大于85重量份且不为0重量份；油酸5～70重量份；甲醇或乙醇或其混合物5～80重量份；表面活性剂1～8重量份；改性添加剂1～15重量份；并可视具体用途添加工业纯水0～45重量份。 The present invention provides a method for producing a biofuel polyol formulation and combination, based on 100 parts by weight of a carbinol-modified composite comprising not more than 85 parts by weight and not to 0 parts by weight; 5 to 70 parts by weight of oleic acid; methanol or 5 to 80 parts by weight of ethanol, or mixtures thereof; 1 to 8 parts by weight of a surfactant; 1 to 15 parts by weight of a modifying additive; and depending on the particular use of industrial water was added 0 to 45 parts by weight. 该多元生物燃油的性状类似石化柴油，可以按一定比例与普通石化柴油混合使用，具有燃烧值高、闪点高和凝点低、冷滤点低、腐蚀性低、排放低及成本低的优势。 The polyhydric biological traits similar petroleum diesel fuel, may be a certain proportion of a mixture with ordinary petroleum diesel, having a high calorific value, high flash point and low freezing point, low cold filter plugging point, low corrosiveness, low emissions, and low cost advantages . 本发明涉及燃料油领域，特别是涉及一种运用多元配方组合的生物燃油及其制备的工艺方法。  The present invention relates to fuel oils, and in particular relates to a process for the preparation of a biofuel and a combined use of polyol formulation. 我国缺油少气，煤炭资源相对丰富，煤基醇醚燃料来源广，以优势醇醚资源替代石油资源，或者使用醇醚类燃料和石油混合物来替代石油资源，有利于生态环境，促进经济的可持续发展，并可创造新的经济增长点。  our country short of petroleum and gas, relatively rich in coal resources, coal-based alcohol ether fuel source wide, to the advantage of resources to replace petroleum resources ether, or use alcohol ether fuel and oil mixture instead of oil resources, eco-friendly, promote sustainable economic development, and create new economic growth point. 很多国家曾推广乙醇汽油，乙醇在石化汽油中的添加量一般为10~15%，但由于乙醇主要来源于农作物，其推广面临着成本和粮食安全等诸多问题，故近年重点推广添加甲醇。  Many countries had to promote ethanol gasoline, add the amount of ethanol in gasoline in petrochemical generally 10 to 15%, but due to the ethanol mainly from crops, its marketing costs and faced with food security and many other issues, it added in recent years, focusing on the promotion methanol. 甲醇主要来源是煤化工或很多化工的副产品，且不与粮农业争夺资源，燃烧时碳排放低，发展甲醇燃油对于解决当前的能源紧缺具有重要的意义。 Methanol is the main source of coal chemical or chemical byproduct of a lot, and do not compete with food resources, agriculture, burning low carbon emissions, the development of methanol fuel is of great significance to solve the current energy shortage. 众所周知市场上最紧缺的是柴油，柴油的用途广，用量大，我国石油燃料的需求缺口主要体现在柴油上，柴油成为紧缺能源中的紧缺产品，国家每年在进口原油的同时还要进口大量的成品柴油，能把甲醇与柴油以混合燃料简便应用并与化石柴油互换使用，是行业众多专家的技术梦想，但迄今尚未较好解决。  As we all know the market's most versatile is the shortage of diesel fuel, diesel, large amount of fuel oil demand gap is mainly reflected in the diesel fuel, diesel oil became scarce energy shortage in the product, but also to the country each year, while imports of crude oil import large quantities of refined diesel fuel, methanol able to mix with diesel fuel use and simple application with fossil diesel swap, is the dream of many technical experts in the industry, but so far has not been a better solution. 据公开资料，德国试验用的M15甲醇-柴油混合燃料中，助溶剂的体积添加量为15%，着火促进剂的体积添加量为1%，燃料的十六烷值可达45,由于助溶剂和着火促进剂的价格都很高，而且用量太大，限制了其在市场燃料中的推广使用。  According to public information, a test of the German M15 methanol - diesel fuel mixture, the volume of co-solvent added in an amount of 15% of the volume of the ignition accelerator is added in an amount of 1%, up to 45 cetane number of fuel, Since the co-solvent and ignition accelerator prices are high, but the amount is too large, limiting its use to promote the fuel in the market. 申请号为201210200197. 4的中国专利申请公开了一种通过多元添加剂混合甲醇基燃料与柴油混溶的技术，存在添加剂组分复杂、闪点与制造工艺、性价比难于取舍的缺点，例如甲醇基燃料采用甲醇和油酸简单混配时闪点低，而采用甲醇改性复合体混配又导致工艺复杂、成本高。  Application No. of China Patent Application No. 201210200197.4 discloses a polyol mixture of methanol-based fuel additive is miscible with diesel fuel in the art, the presence of additive component complex, and a flash point of the manufacturing process, it is difficult to choose the cost disadvantages, e.g. low methanol and methanol-based fuel using simple blending oleic flash point, while the use of a carbinol-modified complex compounding process is complicated and results in high cost. 在另一份申请号为201010274919. 1的中国专利申请中公开了一种甲醇柴油，其表面活性剂采用非离子聚氧乙烯醚类，亲水亲油平衡值为3~6,以及其他助剂。 Disclosed in another Chinese patent application No. 201010274919.1 application in a diesel methanol, which uses a nonionic surfactant polyoxyethylene ethers, hydrophilic-lipophilic balance of from 3 to 6, and other additives . 这些配方都在一定程度可解决甲醇-柴油的互溶问题，但仍然存在着易分层、互溶度与澄明度不足等问题，或性价比低方面的缺陷。 These formulations are to some extent solve methanol - diesel miscible problem, but there are still easy to layer, lack of mutual solubility and clarity issues, or defects in low cost areas. 目前市场上常见的甲醇或乙醇改性燃料油，普遍存在热值低的缺陷；通常所述的生物柴油，大多是指油酸甲酯或油酸甲酯与石化柴油的混合物，存在凝点高、冷滤点高、腐蚀性强及性价比不足的缺陷。  There is currently common on the market modified as methanol or ethanol fuel, low heating value common defect; generally the biodiesel, mostly refers to a mixture of methyl oleate or methyl oleate with fossil diesel, there high pour point, cold filter plugging point high, corrosive and less than cost-effective defect. 本发明的目的在于：提供一种基于甲醇或乙醇、甲醇改性复合体、油酸等多种常规生物原料与石化柴油混配的多元生物燃油，并可视具体用途添加纯水，可按一定比例与普通石化柴油混合使用，具有燃烧高清洁或低碳的特征，以图较大程度地实现节约石油资源、 达到节能减排的技术应用目标。  The object of the present invention is: to provide a bio-based polyol as methanol or ethanol fuel, carbinol-modified complex, oleic acid and other biological materials conventionally compounded with fossil diesel, and depending on the particular use of pure water is added, some may be combined with common petroleum diesel use, combustion having high cleaning features or lower, in order to achieve a greater degree of FIG save oil resources to achieve the target energy saving technology. 为了实现该目标，本发明主要是运用胶体表面化学原理，解决了甲醇或乙醇或其混合物与纯水的改性以及与油酸、甲醇改性复合体的低成本互溶的技术难题，在一定比例范围可与石化柴油充分互溶，使多种原材料互溶成的生物燃料油稳定期长，利于运输储备； 又通过表面活性剂的助乳化作用，使生物燃料油及其混溶柴油形成稳定的油状微胶囊结构，有效地提高燃烧效率，降低碳排放量的目的。  In order to achieve this object, the present invention is mainly the use of the colloid surface chemistry, to solve the technical problems of low cost methanol or ethanol, or a miscible mixture of modified and pure water and oleic acid, carbinol-modified complex, in a certain percentage range sufficiently miscible with fossil diesel, so that a variety of raw materials into biofuels miscible long period of stable, facilitates storage transport; and by emulsification co-surfactant, biological diesel fuel and miscible to form a stable the oily microcapsule structure, effectively improve combustion efficiency, lower emissions of carbon. 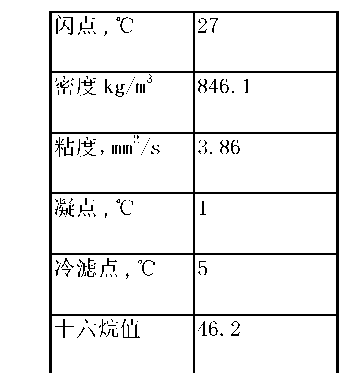 工业纯水0~45重量份。  Industrial water 0 to 45 parts by weight. 所述的甲醇改性复合体，至少包含如下物质中的一种或多种：甲醇与醇缩合而成的醚类（例如叔丁基甲醚）、甲醇与酸缩合而成的酯类（如碳酸二乙酯、油酸甲酯），其加入可有效降低石化柴油的添加量，节省工业成本；但甲醇改性复合体的来源较复杂，其结构链因来源不同而含饱和链的丰度不同，当饱和链丰度太高时会带来燃烧排放增大，同时影响低温流动性，具体制造时可酌情添加。 , wherein the carbinol-modified composite body comprising at least the following substances in one or more of: methanol condensed with an alcohol ethers (e.g. tert-butyl methyl ether), condensation of methanol with an acid ester ( such as diethyl carbonate, methyl oleate), added added in an amount effective to reduce fossil diesel, industrial cost savings; carbinol-modified source but more complex composite body, due to different sources of chain structure and abundance chain saturated different degrees when saturated chain brings high abundance combustion emissions increase, affect the low temperature fluidity, when appropriate, may be added specifically manufactured. 所述油酸（化学简式CH3 (CH2)7CH=CH(CH2) 7C00H)为含18个碳原子和1个双键的不饱和脂肪酸，是构成动、植物油脂的一种重要成分，不溶于水，油酸的来源同样较复杂， 其结构链因来源不同而含饱和链的丰度不同，饱和链丰度太高的油酸低温流动性差，具体制造时宜选择含不饱和链较多的产品；油酸既可以视为甲醇或乙醇或其混合物的乳化剂， 又是将其改性为"亲油"的共聚物。  The oleic acid (Simple chemical formula CH3 (CH2) 7CH = CH (CH2) 7C00H) containing 18 carbon atoms and a double bond in unsaturated fatty acids, constitute the movable An important component of plant oils different water-insoluble, the source of oleic acid likewise more complex, due to different sources of chain structure and abundance saturated chain, unsaturated chain low abundance high oleic poor fluidity, particularly suitable unsaturated chain selected than when producing more products; oleic acid may be regarded as an emulsifier or a mixture of methanol or ethanol, is modified to be "oleophilic" copolymer. 所述的甲醇和乙醇的混合物中，甲醇与乙醇混合的比例可以任意。  The mixture of methanol and ethanol, methanol and ethanol mixing ratio may be arbitrarily. 在现有公开的燃料油技术文献中，有以甲醇改性复合体为主体与石化柴油的互溶体系，也有运用油酸对甲醇或乙醇改性后添加入石化柴油的互溶体系，鲜见甲醇改性复合体与油酸、甲醇或乙醇的互溶体系。  In the prior art document discloses fuel oil, carbinol-modified to have a miscible system complex as a main with fossil diesel, but also the use of oleic acid added to fossil diesel miscible system of modified ethanol or methanol, fresh see carbinol-modified with oleic acid complex, soluble in methanol or ethanol system. 实验证明，后者在表面活性剂作用下，更易形成稳定的胶粒相界面，理论认为，正因为甲醇改性复合体与油酸、甲醇或乙醇的空间结构不同，带来了分子团簇组合的空间结构多样性，即有可能形成燃烧性状表现更理想的复合异构体，这取决于表面活性剂的选用。 Experiments show that, under the latter a surfactant effect, easier to form a stable micelle phase interface, the theory that, because of the complex and carbinol-modified oleic acid, ethanol, methanol or spatial structure of different compositions bring molecular clusters spatial diversity configuration, i.e., it is possible to form a combustion complex traits more desirable isomers, depending on the choice of surfactant. 所述的表面活性剂包括以下物质的一种或多种：司盘系列乳化剂、吐温系列乳化剂、烷基磺酸钠系列、乙醇胺、三乙醇胺、一乙醇胺、溴化十六烷基磺酸钠、二甲基甲酰胺、羧甲基纤维素钠、聚乙烯醇。  The surfactants comprise one or more of the following materials: Span series emulsifier, emulsifier Tween series, alkyl sulfonate series, ethanolamine, triethanolamine, monoethanolamine, sixteen bromide alkyl sulfonate, dimethyl formamide, sodium carboxymethylcellulose, polyvinyl alcohol. 使用不同的表面活性剂对最终合成的燃油性状有所不同，各种表面活性剂各有其特点，亲水亲油平衡值各有差异，即使是同一组分的表面活性剂，也会因含量、纯度不同而影响其亲水亲油平衡值；有的表面活性剂的亲水亲油平衡值较高，例如烷基磺酸钠系列中的十二烷基磺酸钠，使用前应把表面活性剂的亲水亲油平衡值调节至10~ 14,推荐在所述的表面活性剂中复配调节，例如使用司盘系列和吐温系列乳化剂进行复配调节。 Use of different surfactants on the final composite fuel is different trait, a variety of surfactants have their own characteristics, hydrophilic-lipophilic balance value varies, even for the same component of the surfactant, also because of the content of , which affect the purity of the different hydrophilic-lipophilic balance value; high hydrophilic-lipophilic balance value of the surfactant and some, such as the surface of the front group should be in the range of sodium dodecyl sulfonate, using hydrophilic-lipophilic balance value of the active agent adjusted to 10 to 14, recommended complex adjustment of the surfactant in, for example, Span series and Tween series emulsifier complex adjustment. 使用所述的表面活性剂可将甲醇或乙醇或其混合物、水与油酸形成稳定的混合体系。 Methanol or ethanol or a mixture of water and oleic acid in a stable form may be a mixed system according to the use of surfactants. 使用其他的表面活性剂也可以起到类似的效果，但从综合性能方面比较检验，其他类型的表面活性剂不及所述的表面活性剂，会对产品的综合性能有一定程度的影响。 Other surfactants may also play a similar effect, but the overall performance comparison tests, there is a degree of influence of other types of surfactants is less than the surfactant, the overall performance would be the product. 功能改性剂0~40重量份。 0 to 40 parts by weight  The function modifier. 其中，pH值缓冲剂的作用为维持体系的pH值的稳定性，为石油磺酸钠和石油磺酸钡的复配混合物，其中石油磺酸钠占10~40重量份，石油磺酸钡占10~40重量份，复配混合物的重量不低于20重量份、不超过50重量份。  wherein the pH buffering action of the pH to maintain the stability of the system as a complex mixture of petroleum and petroleum sulfonate, barium sulfonate, sodium petroleum sulfonate which accounts for 10 to 40 parts by weight, sulfo oil barium accounts for 10 to 40 parts by weight, the weight of the complex mixture of not less than 20 parts by weight, not more than 50 parts by weight. 可选用的pH缓冲剂必须具有如下的特征：溶于有机溶剂，并且最好是液体，对发动机无腐蚀，并且不会破坏甲醇-油相乳化体系的稳定性，有一定的缓冲能力，凡具有此特征的化合物或者其组合均可以适用于pH缓冲剂。 Optional pH buffering agents must have the following characteristics: soluble in organic solvents, and is preferably a liquid, non-corrosive to the engine, and does not destroy methanol - Stability of oil phase emulsified system, a certain buffer capacity, all having this feature of the compounds or combinations thereof can be suitable pH buffer. 对于本发明，优选石油磺酸钡和石油磺酸钠的组合。 For the combination of the present invention, preferably barium petroleum sulfonate and petroleum sulfonate. 石油磺酸钡（T701)和石油磺酸钠（T702)为行业公知的金属表面防锈剂，分子结构中都有一个强亲水性的磺酸基与烃基相联结，这两种高级脂肪醇的硫酸酯盐的pH值均为7-8,但在溶液状态下由于同离子效应， 离解的可逆平衡度不同，在足够浓度及适当比例下可组合形成理想的pH值缓冲对，溶液中的石油磺酸钠为抗酸成分、石油磺酸钡为抗碱成分；其缓冲共辄构象模型为：石油磺酸钠(R-S020 *Na+)的电离度或离子活度较强，在溶液状态下全部离解出Na+和S02(T;石油磺酸钡（R-S020 *Ba++* 0S02-R)的电离度或离子活度相对弱，在溶液中处于结构游离趋势，主要以R-S03Ba+和SO2(T的形式存在，缓冲剂中Na+和SO3IT的浓度较大；当燃料油混溶体系因吸收空气中的二氧化碳、酯类受氧化出现酸败等因素导致游离态h+总量增加时，so3ir会和体系内的H+结合形成石油磺酸；反之，当燃料油 Barium petroleum sulfonate (T701) and sodium petroleum sulfonate (T702) is the industry known metal surface rust, the molecular structure has a strongly hydrophilic sulfonic acid groups and hydrocarbon phase coupling, two higher aliphatic alcohols the pH of the sulfuric acid ester salt are 7-8, but in a solution state since the common ion effect, a different degree of dissociation of the reversible equilibrium, at a concentration sufficient and appropriate proportions may be combined to form the desired buffering of the pH, the solution acid component is sodium petroleum sulfonate, barium petroleum sulfonic acid alkali component; Noir conformation which co buffer model: sodium petroleum sulfonate (R-S020 * Na +) ion or degree of ionization of strong activity, in a solution state under all dissociated Na + and S02 (T; barium petroleum sulfonate (R-S020 * Ba ++ * 0S02-R) degree of ionization or ion activity is relatively weak, in free trend structure in solution, mainly in the R-S03Ba + and SO2 (T form is present, a large buffer and SO3IT Na + concentrations; when the miscibility fuel system due to absorption of carbon dioxide in the air, oxidation occurs by the esters lead to rancidity and other factors increases the total amount of free time h +, so3ir system will then H + to form within the petroleum sulfonate; the other hand, when the fuel 溶体系因内部组分残留的胺化盐分解或其它因素导致0H富余时，Na+会抑制体系内游离的0H及其它阴离子，从而使燃料油缓冲溶液的酸碱平衡度处于缓冲对的共辄保护范围，使燃料油混溶体系保持稳定。 When the system due to amine solution decomposition of the salt or other factors cause 0H inner component remaining in surplus, Na + inhibits free 0H and other anions in the system, so that the acid-base balance of the fuel to the buffer solution in the buffer of the protective co-Noir range, the fuel oil miscible system remains stable. 所述硝酸异辛酯（又名硝酸2-乙基已酯或硝酸异辛酯），除了可以有效提高柴油/甲醇燃料油/甲醇柴油的十六烷值外，还可以改善燃烧性能，缩短着火时间，降低燃点，提高机车热工况动力性。  The nitrate isooctyl acrylate (also known as 2-ethylhexyl nitrate or nitric acid isooctyl ester), in addition to improve the cetane number of diesel outer / methanol fuel / methanol diesel fuel, the combustion performance can be improved further , to shorten the ignition time, reduced ignition improving locomotive dynamic thermal conditions. 在多元复合燃料油中加入0. 1% -0.3%的硝酸异辛酯，一般可提高十六烷值2-9个单位。 Was added 0.1% -0.3% nitric acid isooctyl ester polyol compound fuel, the cetane number can be increased typically 2-9 units. 所述抗氧剂一般选自苯三唑类（例如T406 :苯三唑十八胺盐，TTAS:甲基苯并三氮唑钠盐，N-壬基氧甲基苯三唑）、噻二唑类（例如T561 :2, 5-双〔烷基二硫代〕噻二唑）以及硫磷型抗氧抗腐蚀剂，这类含硫、磷的抗氧剂的代表性产品为二烷基二硫代磷酸锌（ZDDP)、 T504:硫化烷基酚等。  The antioxidant is generally selected from benzotriazole (e.g. T406: benzotriazole octadecylamine salt, TTAS: methyl benzotriazole salt, N- nonyl-yloxymethyl benzotriazole) , thiadiazolyl (e.g. T561: 2, 5- bis [thio] dialkyl thiadiazole) parathion-type antioxidant and anti-corrosion agents, such sulfur-containing, phosphorus antioxidant is two representative products zinc dialkyl dithiophosphate (ZDDP), T504: sulfurized alkylphenols and the like. 本发明采用的抗氧剂，不仅着眼于削弱所调合基础燃油及添加剂配方中某些助溶剂对铜或其它金属的腐蚀力，同时要削弱添加剂配方中某些助溶剂对橡胶的腐蚀力，且具有油溶性好、还原性强的特点，达到有效提高本组合添加剂配制燃料油抗腐蚀性的目的。 Antioxidants used in the present invention, not only focus on weakening the basic fuel blending additives, and co-solvent formulations of certain corrosive power of the copper or other metal, to simultaneously weaken certain corrosive power of the co-solvent on the rubber formulation additives, oil-soluble and has a good, strong reduction characteristics, to achieve the object of the present compositions to effectively improve the corrosion resistance of the fuel additive formulation. 本发明选择的抗氧剂包括以下几类中的一种或若干种组合：胺型抗氧剂（例如N-苯基-a-萘胺或辛基/ 丁基混合烷基取代的二苯胺）；酸型抗氧剂，例如T501 :2, 6-二叔丁基对甲酚、2, 6-二叔丁基酚、2, 4-二甲基-6-叔丁基酚、T502 :混合型液体屏蔽酚， T5114, 4 :亚甲基双（2, 6-二叔丁基酚）、T512 :酚酯型抗氧剂等；酚胺型抗氧剂，其主要产品例如2, 6-二叔丁基-a-二甲胺基对甲酚；硫磷型抗氧抗腐蚀剂以及二烷基二硫代氨基甲酸盐，使用其中一种或若干种抗氧剂组合，组合使用时不限制相对比例。 The present invention includes one selected antioxidants or several of the following categories combination: amine antioxidant (such as N- octyl or phenyl naphthylamines -a- / butyl mixed alkyl-substituted diphenylamine) ; acid antioxidant, e.g. T501: 2, 6- di-t-butyl-p-cresol, 2,6-di-t-butylphenol, 2,4-dimethyl-6-tert-butylphenol, T502: mixing liquid shield phenol, T5114, 4: methylene-bis (2,6-di-t-butylphenol), T512: phenolic ester antioxidant and the like; phenol-amine type antioxidant, its main products such as 2, 6- -a- dimethylamino-tert-butyl-p-cresol; parathion type antioxidant and anti-corrosive dialkyl dithiocarbamate, using one or a combination of several antioxidants, when used in combination without restrictions relative proportions. 所述的有机溶剂应具有如下的技术特征，如熔点低、流动性好、不破坏乳化体系， 无腐蚀性等；当溶剂的闪点、溶剂辛烷值或十六烷值比较高时，制备所得到的添加剂具有更多的优势。  The organic solvent should have the following technical characteristics, such as low melting point, good fluidity, does not destroy the emulsion system, non-corrosive; when the flash point of the solvent, the solvent is relatively high octane number or cetane number when preparing the additive obtained has more advantages. 有机溶剂可选自芳烃类溶剂、酮类溶剂、酯类溶剂、醚类溶剂，也可选自石油制品溶剂油，如石蜡油、柴油，但不推荐选用对环境可能造成污染的溶剂，比如硝基类溶剂可能会产生氮氧化物的排放。 An organic solvent selected from aromatic hydrocarbon solvents, ketone solvents, ester solvents, ether solvents, petroleum products also be selected from spirits, such as paraffin oil, diesel fuel, but not recommended to use may cause environmental pollution solvents such as nitrate based solvent may cause the emission of nitrogen oxides. 芳烃类溶剂包括甲苯、二甲苯以及其他含有芳环结构的溶剂；酮类溶剂包括丙酮、丁酮以及其他酮类化合物；酯类溶剂包括乙酸乙酯、碳酸二甲酯、原碳酸四甲酯、原甲酸三乙酯等化合物；醚类溶剂则包括叔丁基甲醚、乙二醇二甲醚，以及其他具有醚结构通式的醚。 Aromatic hydrocarbon solvents include toluene, xylene, and other solvents containing aromatic ring structure; ketone solvents include acetone, methyl ethyl ketone and other ketones; ester solvents include ethyl acetate, dimethyl carbonate, tetramethyl orthocarbonate, compounds such as triethyl orthoformate; the ether solvents include t-butyl ether, ethylene glycol dimethyl ether, and other ethers having the general structure of an ether. 所述的功能改性剂为本领域常见的、为了改善柴油的性质而添加的一类添加剂， 其可以根据用途需要灵活添加。  The functional modifier common art, in order to improve the properties of diesel fuel and added in a class of additives which can be flexibly added depending on the use. 比如磷酸三甲酚酯，又称磷酸三甲苯酯，其具有多种异构体，均可以应用于本发明，且效果类似，比如T306,分子式C21H2104P，通常用作增塑剂，例如用于油漆中可增加漆膜的柔韧性，也用作合成橡胶、聚酯、聚烯烃和塑料的阻燃剂。 Such as tricresyl phosphate, tricresyl phosphate, also known, which have a variety of isomers, can be applied to the present invention, and a similar effect, such as T306, formula C21H2104P, generally used as plasticizers, for example for paints increase the flexibility of the film, it is also used as a flame retardant synthetic rubber, polyesters, polyolefins, and plastics. T306溶于醇、苯、醚、植物油、矿物油等多有机溶剂，稳定性强，不易挥发，能赋予高聚物良好的耐磨性，也被引用作汽油和润滑油的添加剂。 T306 is dissolved in alcohol, benzene, ether, vegetable oils, mineral oil, organic solvents multiple, high stability, non-volatile, the polymer can impart good abrasion resistance, it is also cited as a gasoline additive and lubricants. 在本发明组合添加剂的主要角色为抗磨剂，同时充当阻燃剂，对抗磨、阻燃、提高闪点起到多重作用。 The main role of the additive composition of the present invention is an antiwear agent, also acts as a flame retardant, antiwear, flame retardancy, improved flash point multiple roles. 又比如异丁醇通常用作增塑剂、合成橡胶和合成药物等，在石油工业通常用作添加剂，在本发明添加剂配方中的作用，不仅是扮演助溶助乳化的有机溶剂，而且充当多重角色；例如异丁醇的燃烧热为2667. 7kJ/mol，沸点107°C，可助燃、增强燃料油爆发力、提高复合燃油的燃烧热，同时可提高生物燃料油的澄明度，减少燃烧时的积碳；异丁醇以及硝酸异辛酯的组合，可明显地提高复合燃油的十六烷值；异丁醇的凝固点为_l〇7°C，与有机溶剂的组合，可以有效地降低混合燃料油的凝点和冷滤点。 Another example isobutanol commonly used as plasticizers, synthetic rubber and synthetic drugs, commonly used as additives in the oil industry, the role of the additive in the formulations of the present invention, not only playing co-solubilizing organic solvent is emulsified, but also as a multiple role; e.g. isobutanol heat of combustion is 2667. 7kJ / mol, boiling point of 107 ° C, combustion may be enhanced explosive fuel, the composite increase the combustion heat of fuel, while increasing the clarity of biological fuel, during combustion to reduce coke; isobutanol and combinations of isooctyl nitrate, can significantly improve the cetane number of a composite fuel; freezing point of isobutanol _l〇7 ° C, with a combination of an organic solvent, mixing can be effectively reduced fuel oil pour point and cold filter plugging point. 又比如助乳化分散剂，其功能是将本添加剂的组分有效分散至所调合的燃料油，而且可以对所配制的燃料油起到减少积碳、减少静电积聚作用，现有技术对助乳化剂已有一定的研究，而本发明所述的助乳化分散剂，可选自丁二酸酯、聚烯烃丁二酸多羟基醇酯或聚异丁烯的衍生物系列产品（例如1'1544、1'1548、1'16认、1'1618、1'151、1'155、1'1644、1'1654等） 中的一种，或其中若干种组合；例如T161A是以高活性聚异丁烯（分子量为2300)为原料、 采用热加合工艺制备的高分子量无灰分散剂，具有良好的烟灰、油泥的分散和增溶作用，能有效地抑制燃料油的粘度增长。 Another example is co-emulsifying and dispersing agent, its function is to effectively disperse the components of the present additive to the fuel blending, and may serve to reduce the carbon fuel oil formulated to reduce static build-up effect of the prior art co emulsifier has a certain study, and co-emulsifying and dispersing agent according to the present invention, selected from the succinate, the polyolefin succinic acid or polyhydric alcohol esters of polyisobutylene derivative products (e.g. 1'1544, one) recognition of 1'1548,1'16, 1'1618,1'151,1'155,1'1644,1'1654 the like, wherein several or combinations thereof; e.g. T161A is highly reactive polyisobutylene ( molecular weight 2300) as raw materials, a high molecular weight prepared by process heat ashless dispersant additive, a good soot dispersion and solubilization of the sludge, can be effectively suppressed by viscosity growth fuel oil. 实际应用中，可以根据需要灵活添加功能改性剂而不局限于上述种类的改性添加剂。 In practice, the flexibility modifying agent necessary to add functionality without being limited to the above-described kind modifying additive. 所述的工业纯水为去离子水。  The industrial water is deionized water. 因普通水（例如自来水、井水）中含有不少杂质，其内所含的盐类以及pH都各不相同，这些杂质虽微量，但会严重影响燃料油长期存放的乳化稳定效果；纯水获得的工业方法已很成熟，去离子水通常用原水通过电渗析器法、离子交换器法、反渗透法而制得。 Because ordinary water (such as tap water, well water) contains a lot of impurities, and the pH of the salts contained therein are not the same, although these trace impurities, but will seriously affect the long-term emulsion stabilizing effect fuel storage; water obtained in industrial processes are mature, deionized water, raw water is usually prepared by electrodialysis, ion exchangers, reverse osmosis. 纯水的添加量选择范围与所制作的燃料油的用途有关，当制作的燃料油直接用于燃烧时，在所述的取值范围（0~45%)宜取中值以下以保证燃料油的燃烧性状，当制作的燃料油按一定比例与常规石化燃油混合燃烧时，可取中值以上的范围。 Amount of pure water was added and the choice of the use of fuel oil produced, and when the production of fuel oil was used directly in combustion, in the value range (0 to 45%) should be taken to ensure that the fuel value trait combustion, when the fuel oil produced by a certain percentage with conventional petrochemical fuel mixture combustion, preferably in the above range. 1、机理：在表面活性剂和改性添加剂的作用下，甲醇_水-油酸-甲醇改性复合体的互溶微结构变相为一种油包水型的微乳液，表面燃烧时，内部甲醇与水因气化而体积急剧膨胀，产生的巨大压力使油滴爆破，从而使油滴进一步微细化，在燃烧过程中形成二次雾化，使之与空气的接触面积大幅度增加，提高燃烧效率。  1, the mechanism: the role of a surfactant and modifying additives, methanol and water _ - Oleic acid - modified composite microstructure miscible methanol disguised as a water-in-oil microemulsion, the surface combustion internal methanol and water vaporized by the rapid expansion of the volume, the oil droplets generated enormous pressure blasting, so that the oil droplets further miniaturization, the formation of secondary atomization in the combustion process, the contact area with the air is increased significantly and improve combustion efficiency. 2、加速燃烧反应：在油包水型油滴爆破的气化过程中，多元体系中的0H基团活性大大增强，一氧化碳得到了较完全的燃烧，从而加速燃料油体系裂解所形成焦炭的燃烧，抑制了混溶燃料油燃烧时烟尘的生成，达到减排效果。  2, to accelerate the combustion reaction: In the gasification process oil type oil droplets in blasting, 0H group reactive polyol greatly enhanced system, the carbon monoxide to give a more complete combustion, thus accelerating the formation of cleavage fuel system combustion of the coke, inhibiting the generation of smoke when burning fuel-miscible, to achieve emission reduction. 纯水尤其是能量激发至亚稳态的纯水，其空间态分布是近年理论界关注的一个重要论题，一些更新观念对表面活性剂的组合选用有利于重大技术突破。  water, especially energy metastable excited to pure water, the spatial distribution of state is an important topic of concern in recent years, theorists, some of the new ideas of the combination of surfactants selected in favor of a major technological breakthrough. 众所周知，水分子由两个氢原子和一个氧原子组成，空间呈非对称结构，因氢气可燃、氧气助燃，裂解水分子获得廉价能源成了代代传承的科学梦想。 Is well known, water molecules by two hydrogen atoms and one oxygen atom, in a non-symmetrical configuration space, because a combustible hydrogen and oxygen combustion, pyrolysis water molecules obtained SCIENCES dream became cheap energy from generation to generation of. 本申请人之一在发明专利（ZL200410074446. 5)申请文件中提出：迄今对水的分析对象都是大量的水分子集合，在"足够小"的微观体系中是否等价存在逻辑等价漏洞。 One of the present invention, in the patent applicant (ZL200410074446 5.) Application documents: Analysis to date are subject to water subset large amount of water, the "sufficiently small" micro system are equivalent flaw exists logically equivalent. 近年由于显微成像特别是数据处理技术的进步，使各国基础研究实验室均可重复地观察到纯水的钠米尺度结构，迄今已知道：纯水通常为13-18个分子团簇结构，与其理解宏观水的结构为H20远不如理解为nH20更接近真实；科学界已逐步认同新观点：宏观意义上的水由水分子团簇构成，团簇大小直接关联到水的物理化学特性。 Due to the recent progress in particular microscopic imaging data processing technology, the basic research laboratory States could be repeatedly observed nanometer scale structure of the water, heretofore been known: a water molecule clusters typically 13-18 structures, its understanding of the macro-structure of water is H20 is far less understood as nH20 closer to the truth; the scientific community has been gradually recognized a new point of view: the water on the macro sense is composed of water clusters, cluster size is directly related to the physical and chemical properties of water. 目前技术直接电解水对于能源代价得不偿失，但将水用化学方法混溶至多元结构体系后，更容易通过水分子参与胶体微分散体系的空间结构重组途径，获得水分子键合态变换及其过程而产生的廉价能源。  Direct current technology for the electrolysis of water outweigh the cost of energy, but to the water miscible polyhydric chemically architecture, the spatial structure of colloidal particles recombination pathway easier dispersion by water molecules participate, to obtain a water molecule bonding state transformation cheap energy and process produced. 对于水的作用过程，理论认为，在小于94nm(钠米）的胶体微分散体系的团簇尺度内，水分子在外部条件作用下参与充分互溶可形成空间结构更复杂的团簇，在高温状态下，呈非对称结构的水分子，相当一部分氢原子会在燃烧过程逸出到自由程参与反应，带来了燃料油体系内部的"富氧"倾向，使之燃烧性状更理想。 For the process of the role of water, the theory that, in less than of 94 nm (nanometer) scale clusters finely dispersed colloidal system, water molecules are involved in the action of external conditions may be fully miscible form more complex spatial structure of clusters in a high temperature state , the water molecules form an asymmetric structure, a considerable portion of the hydrogen atoms in the combustion process will escape into free path involved in the reaction, bringing the inside of the fuel system "enriched" the tendency to make the combustion more desirable traits. 多元结构燃料油的团簇空间结构形成，既与主原料选材以及表面活性剂有关，同时也与制备方法相关。 Spatial structure polyhydric fuel cluster structure is formed, both the selection of raw materials and the main surfactant about, but also related to the preparation process. 2)将步骤1)得到的混合物、油酸、甲醇改性复合体和改性添加剂混合均匀，制得生物燃油。  2) Step 1) to give a mixture of oleic acid, carbinol-modified complexes and modifying additives mixed to prepare a biofuel. 其中油酸和改性添加剂的加入顺序以及加料方式灵活。  wherein the order of addition of oleic acid and flexibility modifying additives and feeding methods. 比如向步骤1)得到的混合物中加入油酸，然后与甲醇改性复合体混合均匀；或将油酸和甲醇改性复合体混合后，与步骤1)得到的混合物混合均匀；或向步骤1)得到的混合物和甲醇改性复合体中分别加入油酸，然后将两部分混合物混合均匀。 For example a mixture of 1) obtained in the step of oleic acid was added, and then mixed uniformly with the carbinol-modified complex; methanol after oleic or modified compound mixed with the step 1) was obtained by mixing uniformly; or Step 1 ) and methanol-modified composite obtained in oleic acid were added, and the mixture was uniformly mixed the two parts. 之后再与改性添加剂充分搅拌混合。 After then thoroughly mixed with the modifying additive. 步骤2)中，当得到的混合物澄明度不足时，可补充表面活性剂或油酸，通过调节油酸和表面活性剂的比例来调节至澄明。  Step 2), when the clarity is insufficient resulting mixture, a surfactant may be supplemented or oleic acid, oleic acid, and by adjusting the ratio of the surfactant is adjusted to clear. 步骤1)所述的表面活性剂，当选用单组分的亲水亲油平衡值不处于10~14范围内时，采用所述的表面活性剂的两种或多种进行复配调节。 When  Step 1) of the surfactant, HLB value of a single component is not elected in the range of 10 to 14, the use of a surfactant is compounded with two or more regulation. 步骤1)中加入纯水时，优选的，纯水与甲醇或乙醇的质量比为1:0. 5~2. 0,加入的甲醇或乙醇或其混合物和油酸的质量比为1:0. 5~3. 0 ;所述步骤1)中不加入纯水时， 优选的，加入的甲醇或乙醇或其混合物和油酸的质量比为1:0. 5~2. 5。  Step 1) was added to pure water, preferably, the mass ratio of water and methanol or ethanol is 1: 05 ~ 20, mass is added a mixture of methanol or ethanol, or a ratio of oleic acid and . 1: 05 ~ 30; said step 1) is not added to water, preferably, added mass or a mixture of methanol or ethanol and oleic acid ratio of 1: 05 ~ 25... 纯水的加入量，应视混合燃料油使用领域特别是对表面活性剂的掌握程度而定，还需考虑到纯水加入对燃料油的燃烧性状和粘度、比重等理化指标的影响。 Amount of pure water was added, should be used depending on the particular field of fuel oil mixed mastery of the surfactant may be, need to consider the impact of pure water was added to the fuel oil combustion traits and viscosity, specific gravity and other physical and chemical indicators. 一般而言，纯水运用得当可提高燃料油的开口闪点，同时带来燃料油体系内部的"富氧"倾向，有利于常压状态下燃烧，而用于压燃机领域的燃料油需慎重，如果对表面活性剂的掌握程度较浅，可少加甚至不添加纯水。 In general, water may be used properly increase the flash point of the opening of the fuel, while bringing the interior of the fuel system "enriched" tendency, under normal pressure conditions conducive to combustion, and the field of gas turbine fuel oil for pressing needs carefully, if the mastery of the surfactant is shallow, even a small increase can be pure water. 步骤1)得到的混合物需要借助添加油酸形成稳定的乳化体系，该方法步骤2)可选，油酸既可在步骤1)后直接加入，亦可全部与甲醇改性复合体混合后向步骤1)得到的混合物添加，优选将油酸拆分为两份分别在在步骤1)后加入和与甲醇改性复合体混合；无论油酸是在步骤1)后添加、还是先与甲醇改性复合体混合再添加到步骤1)得到的混合物中， 当油酸的添加量适当时都可在常温形成澄明的稳定体系。  Step 1) was obtained by the addition of oleic acid required to form a stable emulsion system, the method step 2) optionally, oleic acid is added either directly after step a), may also be mixed with all of the modified composite methanol 1 mixture) obtained in the step of adding, preferably split into two oleic acid were added and mixed with methanol in a complex modification after step 1); whether oleic acid is added after step a), or the first and carbinol-modified complex being added to the mixing step 1) was obtained, when the amount of oleic acid can be formed of a suitable stabilizing system clear at room temperature. 但在具体操作中，由于油酸的来源复杂，并且其乳化能力与环境温度有关系，即使是同一来源油酸按同样程序操作，也会因受到低温而影响所形成混合物的澄明度和稳定性，因此本发明实施的制备方法，推荐在同一温度区间混合，例如30~40°C温度区间；优选将油酸添加量拆分为在步骤1)后和在甲醇改性复合体中分别加入，步骤1)后的油酸添加量以调节混合物的澄明度为目标，得到第一混合物，设计值添加的余量油酸加入到甲醇改性复合体中，得到第二混合物，然后，把第一混合物和第二混合物相混，充分搅拌均匀。 But in actuality, because of the complexity of the source of oleic acid, and emulsifying ability and the ambient temperature are related, even in the same program operating in the same source as oleic acid, may also be due to the low temperature stability of the mixture and affect the clarity of the formed Therefore the present invention is prepared, in the same temperature range recommended mixing, for example, 30 ~ 40 ° C temperature range; oleic acid is preferably added in an amount of splitting at) are added after step 1 in methanol and the modified composite body, amount of oleic acid added in step 1) the clarity of the mixture to adjust the target, to give a first mixture, adding the value of the design margin of oleic acid was added to a carbinol-modified complex, to give a second mixture, and then, the first and second mixtures were mixed, fully stirred. 为了使最终形成的混合物的酸度达到柴油国标值，可以加入石油磺酸钠或石油磺酸钡或其混合物调节，使多元生物燃油的酸度小于7mgK0H/100mL。  In order to form the final acidity of the mixture reaches a target value Chaiyou Guo, may be added or barium petroleum sulfonate oil acid or mixtures thereof adjusted so that the pH is less than biofuel polyhydric 7mgK0H / 100mL. 所述的制备方法可在常温常压下混合，亦可加温加压助反应，所述的搅拌或混合包括旋转式搅拌、周期性或切角随机的剪切式搅拌，以及外加磁激共振混合或反应压力混合，当使用加反应压力混合时，反应压力不超过25MPa。 Preparation Method  may be mixed at the normal temperature and pressure, heat and pressure can also help the reaction, the agitation or mixing include stirring rotary, random, periodic or chamfer shear agitation, and applied magnetic resonances in mixing or mix reaction pressure, the reaction pressure applied when using mixing, the reaction pressure does not exceed 25MPa. 常规的加压反应装置容易在市场上采购得，关于磁激共振装置，在"一种液体能量激发装置"(ZL200410074446. 5)中已有详述， 该装置包括用金属或金属网附带成型材料的液体处理腔（波导腔），腔内沿进出液口通道以m间距交替排布的n对永磁体（m彡0. 2mm，n彡2)，内置或配置于腔体内具有彡1个谐振点，可使受处理液体的物理化学特性如溶解度、含氧量、渗透性、反应速率等发生较大改观。 Conventional pressurized reactor apparatus easy to purchase on the market have, on the magnetic resonance excitation means, in the "excitation energy to a liquid means" (ZL200410074446. 5) already described in detail, the apparatus including incidental forming a metal or a metal mesh material the liquid treatment chamber (waveguide cavity), and out of the cavity along a liquid inlet passage at a pitch m n of alternately arranged permanent magnet (m San 0. 2mm, n San 2), having built-in or arranged in San a resonant cavity point allows the physicochemical properties such as solubility in the liquid being treated, oxygen permeability, there is a greater improvement in the reaction rate and the like. 值得特别说明，充分互溶是多元燃料油体系技术成功的前提，该技术效果可通过丁铎尔（Tyndall)现象进行检验，行业内公知，波长为400-700mm的光通过燃料油体系时， 如果均匀分散的胶体粒子直径小于入射光波长会发生散射。  worthy of special note, is fully miscible multi-fuel system technical prerequisite for success, the technical effect can be tested by Tyndall (Tyndall) phenomenon, known in the industry, 400-700mm wavelength of light fuel oil system through time , if uniformly dispersed colloidal particle diameter smaller than the wavelength of the incident light scattering occurs. 目前的实验结论为：当分散体系的粒子直径< 94nm时，散射击光强度与波长的四次方成反比，丁铎尔现象将很明显；反之，可检验出所制作的燃料油体系不成功。 The present experimental results as follows: When the particle diameter of the dispersed system <time of 94 nm, scattered light intensity versus wavelength shot in inverse proportion to the fourth power, Tyndall phenomenon will be apparent; on the contrary, the test may be produced by the fuel system is not successful. 上述制备方法是一种优选推荐，对于本领域研究较深入的人员，完全可通过优选表面活性剂及在混合过程中对亲水亲油平衡值的调节进行等同变换；例如将改性添加剂在步骤1)后加入，或加入到油酸与甲醇改性复合体的混合物中，甚至拆分为若干份分别在不同的混合步骤中加入，通过补充调整表面活性剂及油酸的相对比例使混合物变澄明。  The preferred methods of preparation are recommended for more in-depth research in this field personnel, can be completely converted by equivalent regulation of surfactant and preferably a hydrophilic-lipophilic balance of the mixing process; e.g. the modified additive after step 1) is added, or a mixture of oleic acid was added to the methanol-modified complex, even split into several parts were added in separate mixing step, the relative proportion of oleic acid to adjust the surface active agent added by The mixture becomes clear. 这些等同替换的制备工艺虽亦可操作，但在不同的环境温度条件下容易产生少量异构体，影响燃油的燃烧性能或外观澄明度；在多元材料的组合中，，采用先将水相物通过表面活性剂转化为油溶性混合物、然后再与油相物互混后加改性添加剂的工艺顺序，所获得产品的稳定性和外观澄明度会更佳。 Although these equivalents preparation process can operate, but prone to minor isomer under different ambient temperature conditions, affect the performance or appearance of the clarity of the combustion of fuel; the combination of multiple materials in the aqueous phase was first employed ,, conversion by an oil-soluble surfactant is a mixture with the oil phase was then admixed with the mutual modifying additive process sequence, stability and clarity of the appearance of the product obtained will be better. 在本发明的具体实施中，不同的选材组合与投料混合程序，在最终混合物稳定状态类似的前提下，可能会出现澄明度与燃烧（包括压燃）性状的矛盾，后者往往与丁铎尔现象的显态程度相关。  In a particular embodiment of the present invention, a different selection in combination with the feed mixing procedure, in a similar premise final mixture steady state, conflicts trait may occur clarity and combustion (including compression-ignition), which is often associated with significant degree of state Tyndall phenomenon related. 燃料油的主要功能是燃烧（包括压燃），当两者不可兼得时，推荐燃烧性状最优化的配方与细化工艺。 The main function of fuel combustion (including compression-ignition), when the two are mutually exclusive, optimized combustion traits recommended formula and process refinement. 5、稳定期长：稳定期多6个月，适应储存、运输和销售各环节所需的时间。  5, long period of stable: stable for more than six months, the time needed to adapt storage transportation and marketing of all sectors. 下面将描述本发明优选的几个实施例，但是本发明不局限于此。  The following preferred embodiments of the present invention is described with several embodiments, but the present invention is not limited thereto. 功能改性剂30重量份，包括异丁醇28重量份，磷酸三甲酚酯1. 0重量份（可选）， 助乳化分散剂1. 0重量份（可选）。  30 parts by weight of functional modifier comprising 28 parts by weight of isobutanol, tricresyl phosphate 1.0 parts by weight (optional), co-emulsifying and dispersing agent 1.0 parts by weight (optional). 功能改性剂4. 5重量份，包括磷酸三甲酚酯2重量份，丁二酸酯0.5重量份，异丁醇2重量份。  The function modifier 4.5 parts by weight, comprising 2 parts by weight of tricresyl phosphate, 0.5 parts by weight of succinate, 2 parts by weight of isobutanol. 功能改性剂2重量份，包括磷酸三甲酚酯1. 5重量份，丁二酸酯0. 5重量份。  2 parts by weight of the functional modifier include tricresyl phosphate 1.5 parts by weight, 0.5 parts by weight succinate. 功能改性剂40重量份，包括异丁醇30重量份，磷酸三甲酚酯5重量份，丁二酸酯5重量份。  40 parts by weight of functional modifier comprising 30 parts by weight of isobutanol, 5 parts of tricresyl phosphate, by weight, 5 parts by weight succinate. 有机溶剂25重量份，选择甲苯、乙酸乙酯和叔丁基甲醚的3 :1 :1的混合物。  25 parts by weight of an organic solvent, selected toluene, ethyl acetate and tert-butyl methyl ether 3: 1 mixture of: 1. 表面活性剂，选择以下物质的一种或多种组合：司盘系列乳化剂、吐温系列乳化剂、烷基磺酸钠系列、乙醇胺、三乙醇胺、一乙醇胺、溴化十六烷基磺酸钠、二甲基甲酰胺、羧甲基纤维素钠、聚乙烯醇。  surfactants, select one or more of the following substances in combination: an emulsifier Span series, Tween series emulsifier, alkyl sulfonate series, ethanolamine, triethanolamine, monoethanolamine, bromide hexadecane sulfonate, dimethyl formamide, sodium carboxymethylcellulose, polyvinyl alcohol. 使用前将表面活性剂的亲水亲油平衡值调节至10~14,当选用的单一组分表面活性剂不符合亲水亲油平衡值要求时，优选采用上述的表面活性剂复配调节至10~14。 When prior to use hydrophilic-lipophilic balance value of the surfactant is adjusted to 10 to 14, the single component surfactant does not comply with election HLB value requirement is preferable to use the above surfactant was adjusted to compound 10 to 14. 比如向步骤1)得到的混合物中分步加入油酸，然后与甲醇改性复合体混合均匀； 或将油酸和甲醇改性复合体混合后，与步骤1)得到的混合物混合均匀；或将向甲醇改性复合体和步骤1)得到的混合物中分别加入油酸，然后将两部分混合物混合均匀。  For example 1) the mixture obtained in step by fractional oleic acid was added, and then mixed uniformly with the carbinol-modified composite; or 1) obtained after mixing the mixture of methanol and oleic acid modified composite body, and the step of uniformly mixing ; or carbinol-modified complexes and will step 1) was obtained in oleic acid were added, and the mixture was uniformly mixed the two parts. 之后加入改性添加剂，充分搅拌混合。 After the addition of modifying additives, sufficiently stirred and mixed. 5)向步骤4)得到的混合物加入改性添加剂，充分搅拌混合。  5) 4 mixture) obtained in the step of modifying additive was added, sufficiently stirred and mixed. 制备方法中，水和甲醇改性复合体的添加量不同时为0。 Preparation of  the method, the amount of added water and methanol-modified complex are not simultaneously 0. 可选的，在步骤5)得到的混合物中，选择性加入石油磺酸钠或石油磺酸钡或其组合物，使最终得到的多元生物燃油的酸度小于7mgK0H/100mL。  Optionally, the mixture of step 5) is obtained, the selective addition of petroleum or petroleum sulfonate, barium sulfonate, or combinations thereof, polyhydric acidity resulting biofuel less than 7mgK0H / 100mL. 由于本发明的要点在于对原料的改性，因此按照上述的几种方法制备获得的燃料油的性状和理化数据类似，本领域技术人员可以根据实际情况灵活选择。  Since the gist of the present invention is that modification of the raw material, according to the above thus Several methods for preparing the obtained fuel oil properties and physical data similar to those skilled in the art can be flexibly selected according to actual situation. 工业纯水12重量份。  12 parts by weight of industrial water. 上述原料共100重量份。  100 parts by weight of the total of the raw material. 按上述方法操作，最后得到一棕色的油状液体，测得用户关心的几项主要技术指标如表1所示。 Operating as described above, and finally to give a brown oily liquid, measured as shown in Table 1 users concerned major techniques. 将本实施例所得的棕色的油状液体的外观酷似常规石化柴油，无论是直接燃烧还是使用3~5 :1重量比混配0#石化柴油用于燃烧，相对于0#石化柴油的燃烧性状，送风量相对可减少一半以上，从火焰形状可明显判别本实施例制得的多元生物燃油含氧量充足， 燃烧充分，碳排放较低。  The appearance of the resulting oily brown liquid according to the present embodiment resembles a conventional petroleum diesel, either direct combustion or the use of 3 to 5: 1 ratio by weight compounded for burning fossil diesel # 0, # 0 with respect to fossil diesel combustion Characteristics blowing amount can be reduced relative to more than half, from the flame shape can be determined according to the present embodiment significantly polyhydric sufficient oxygen biofuel obtained embodiment, combustion, lower emissions. 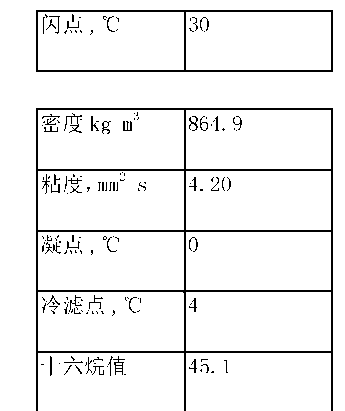 改性添加剂iv8重量份。  iv8 parts by weight of a modifying additive. 上述原料共100重量份，本实施例不含水。  100 parts by weight of the total of the raw material, non-aqueous embodiment of the present embodiment. 按上述方法操作，最后得到一棕色的油状液体，测得用户关心的几项主要技术指标如表2所示。 Operating as described above, and finally to give a brown oily liquid, measured user interest major techniques shown in Table 2. 将本实施例所得的棕色的油状液体用于常规柴油机，压燃工况稳定。  The oily brown liquid obtained in Example of the present embodiment is used in a conventional diesel engine, a compression ignition stable condition. 亦可以用1 : 1重量比例与常规石化柴油混配，在常规柴油机使用。 1 can also be used: 1 ratio by weight compounded with conventional petroleum diesel, in conventional diesel engines. 工业纯水14重量份。  14 parts by weight of industrial water. 上述原料共100重量份。  100 parts by weight of the total of the raw material. 按前述方法操作，最后得到一棕色的油状液体，同样可取得与实施例1类似的燃烧效果。 Operating as previously described, and finally to give a brown oily liquid, can be obtained with the same burning effect similar to Example 1. 工业纯水2重量份。  2 parts by weight of industrial water. 上述原料共100重量份。  100 parts by weight of the total of the raw material. 按前述方法操作，最后得到一棕色的油状液体，同样可取得与实施例3类似的燃烧效果。 Operating as previously described, and finally to give a brown oily liquid, can be obtained with the same burning effect similar to embodiment 3 embodiment. 工业纯水20重量份。  20 parts by weight of industrial water. 上述原料共100重量份。  100 parts by weight of the total of the raw material. 按前述方法操作，最后得到一棕色的油状液体，其在常压下的燃烧性状与实施例1类似。 Operating as previously described, and finally to give a brown oily liquid, which is similar to Example 1 traits combustion at atmospheric pressure and embodiment. 工业纯水25重量份。  25 parts by weight of industrial water. 上述原料共100重量份。  100 parts by weight of the total of the raw material. 按前述方法操作，最后得到一棕色的油状液体，其与常规石化柴油按1 :2混配，成功点火后的燃烧性状与实施例6类似。 Operating as previously described, and finally to give a brown oily liquid, which is a conventional petroleum diesel with a 1: 2 mixed success combustion traits similar to Example 6 after ignition. 亦可以用1 :1重量比例与常规石化柴油混配，燃烧效果更佳。 1 can also be used: 1 ratio by weight compounded with conventional petroleum diesel, better combustion. 工业纯水45重量份。  45 parts by weight of industrial water. 上述原料共100重量份，按上述方法操作，最后得到一棕色的油状液体，用1 :4重量比例与常规石化柴油混配，其燃烧性状与实施例1类似。  100 parts by weight of the total of the raw material, the operation as described above, and finally to give a brown oily liquid, with a 1: 4 ratio by weight compounded with conventional petroleum diesel, which is similar to Example 1 Combustion Characteristics embodiment. 工业纯水10重量份。  10 parts by weight of industrial water. 上述原料共100重量份。  100 parts by weight of the total of the raw material. 按上述方法操作，最后得到一棕色的油状液体，其燃烧性状与实施例1类似，用于常规柴油机的压燃工况与实施例2类似。 Operating as described above, and finally to give a brown oily liquid, which is similar to Example 1 Combustion Characteristics embodiment, a conventional compression ignition diesel engine operating conditions similar to Example 2. 上述原料共100重量份。  100 parts by weight of the total of the raw material. 按上述方法操作，最后得到一棕色的油状液体，其燃烧性状与实施例1类似。 Operating as described above, and finally to give a brown oily liquid, which is similar to Example 1 Combustion Characteristics embodiment. 工业纯水3重量份。  3 parts by weight of industrial water. 上述原料共100重量份。  100 parts by weight of the total of the raw material. 按上述方法操作，最后得到一棕色的油状液体，可用于直接燃烧，亦可用1 :3重量比例与常规石化柴油混配，其燃烧性状与实施例1类似。 Operating as described above, and finally to give a brown oily liquid, it may be used for direct combustion, also with a 1: 3 ratio by weight compounded with conventional petroleum diesel, which is similar to Example 1 Combustion Characteristics embodiment. 多元生物燃油8和0#柴油在1 :0. 5~2的重量比范围内以任意比例混合，当混合澄明度不足时，加入所述的表面活性剂调节，最后得到一棕色的油状液体，其燃烧性状与实施例1类似，用于常规柴油机的压燃工况与实施例2类似。  and the polyhydric biofuel 8 0 # diesel oil in 1: 05 to 2 wt mixed in any proportion ratio range, when the mixing is insufficient clarity, the surfactant is added adjustment finally obtain a brown oily liquid which combustion traits similar to Example 1, a conventional compression ignition diesel engine operating conditions similar to Example 2. 本实施例的0#柴油也可以置换为市场常见的低档催化柴油或甲醇柴油，可改善燃烧性状。 0 # diesel embodiment according to the present embodiment may be replaced with a common market, low catalytic diesel diesel or methanol, can improve combustion trait. 以上实施例仅用以说明本发明的技术方案而非限制，尽管参照实施例对本发明进行了详细说明，本领域的普通技术人员应当理解，对本发明的技术方案进行修改或者等同替换，都不脱离本发明技术方案的精神和范围，其均应涵盖在本发明的权利要求范围当中。  the above embodiments are intended to illustrate the present invention and not limitation, although the present invention has been described in detail with reference to exemplary embodiments, those of ordinary skill will appreciate, modifications to the technical solutions of the present invention, or equivalent replacements, without departing from the spirit and scope of the technical solutions of the present invention, which should be covered by the present invention as claimed in which the required range. 1. 一种多元配方组合的生物燃油，其特征在于，基于100重量份的生物燃油，由以下的组分组成： 甲醇改性复合体不大于85重量份，且不为0重量份； 油酸5~70重量份； 甲醇或乙醇，或其混合物5~80重量份； 表面活性剂1~8重量份； 改性添加剂1~15重量份； 工业纯水0~45重量份； 所述的甲醇改性复合体，至少包含如下物质中的一种或多种：甲醇与醇缩合而成的醚类、甲醇与酸缩合而成的酯类；所述的工业纯水为去离子水； 所述工业纯水含量不为0重量份时，所述工业纯水与甲醇或乙醇或其混合物的质量比为1:0. 5~2.0,所述甲醇或乙醇或其混合物与所述的油酸的质量比为1:0. 5~3.0 ;所述生物燃油不包含工业纯水时，所述的甲醇或乙醇或其混合物和所述的油酸的质量比为1: 0• 5 ~2. 5 ; 所述的表面活性剂包括以下物质的一种或多种：司盘系列乳化剂、吐温系列乳化剂 A polyol formulation biological fuel composition, wherein, based on 100 parts by weight of biofuel, by the following components: methanol-modified composite of no greater than 85 parts by weight, and not to 0 parts by weight; oleic 5 to 70 parts by weight; 5 to 80 parts by weight of methanol or ethanol, or mixtures thereof; 1 to 8 parts by weight of a surfactant; 1 to 15 parts by weight of a modifying additive; industrial water 0 to 45 parts by weight; the methanol modified composite body, comprising the following materials at least one or more of: methanol condensed with an alcohol ethers, condensation of methanol with an acid ester; the industrial water is deionized water; the when industrial water content is not 0 parts by weight, the mass of the industrial water with methanol or ethanol, or a mixture ratio of 1: 05 to 2.0, the methanol or ethanol, or a mixture of oleic acid and the mass ratio of 1: 3.0 ~ 05; biofuel does not comprise said industrial water, the mass ratio of methanol or ethanol or mixtures thereof and said oleic acid is 1:. 0 • 5 ~ 2 5. ; said surfactant comprises one or more of the following materials: Span series emulsifier, the emulsifier Tween series 烷基磺酸钠、三乙醇胺、一乙醇胺、二甲基甲酰胺、羧甲基纤维素钠、聚乙烯醇； 所述的改性添加剂，基于100重量份包括： PH值缓冲剂20~50重量份； 硝酸异辛酯5~20重量份； 抗氧剂〇. 5~5重量份； 有机溶剂10~40重量份； 功能改性剂〇~40重量份； 所述PH值缓冲剂为石油磺酸钠和石油磺酸钡的复配混合物，所述石油磺酸钠占10~ 40重量份，所述石油磺酸钡占10~40重量份，所述复配混合物的重量不低于20重量份，不超过50重量份； 所述的抗氧剂包括如下物质中的一种或多种：胺型抗氧剂、酚型抗氧剂、酚胺型抗氧剂、硫磷型抗氧抗腐蚀剂、二烷基二硫代氨基甲酸盐、苯三唑类化合物和噻二唑类化合物； 所述的有机溶剂包括以下溶剂中的一种或多种：芳烃类溶剂、酮类溶剂、酯类溶剂、醚类溶剂以及石油制品类溶剂油，所述石油制品类溶剂油包括石蜡油、柴 Alkyl sulfonate, triethanolamine, monoethanolamine, dimethyl formamide, sodium carboxymethylcellulose, polyvinyl alcohol; said modifying additive, based on 100 parts by weight comprising: PH buffering agent 20 to 50 wt. parts; ethylhexyl nitrate 5 to 20 parts by weight;. 5 billion to 5 parts of antioxidant by weight; 10 to 40 parts by weight of an organic solvent; functional modifier billion to 40 parts by weight; the PH buffering agent is a petroleum sulfonate complex mixture of sodium and barium petroleum sulfonate, the petroleum sulfonate accounts for 10 to 40 parts by weight of said petroleum sulfonate, barium accounts for 10 to 40 parts by weight, the weight of the compound mixture is not less than 20 wt. parts, not more than 50 parts by weight; the antioxidant comprises one or more of the following substances: an amine antioxidant, phenolic antioxidant, amine antioxidant phenol, parathion type antioxidant anti etchant, dialkyl dithiocarbamate, benzotriazole compounds and thiadiazole compound; the organic solvent is a solvent comprising one or more of: aromatic hydrocarbon solvents, ketone solvents, ester solvents, ether solvents and petroleum products, solvent oil, petroleum products, the solvent oils include paraffin oil, diesel 油； 所述的功能改性剂包括以下物质的一种或多种：磷酸三甲酚酯〇~15重量份、助乳化分散剂〇~5重量份、异丁醇0~30重量份。 Oil; the function modifier comprises one or more of the following substances: tricresyl billion by weight to 15 parts, co-emulsifying and dispersing agent to 5 billion parts by weight of isobutanol 0 to 30 parts by weight. 2. 根据权利要求1所述的生物燃油，其特征在于，所述的工业纯水使用磁激共振处理。 Biofuels according to claim 1, characterized in that said industrial water using a magnetic resonance excitation process. 3.-种制备权利要求1~2任一所述多元配方组合生物燃油的方法，包括： 1) 将表面活性剂的亲水亲油平衡值调节为10~14,后与甲醇或乙醇或其混合物，和水充分混合均匀；或与甲醇或乙醇或其混合物充分混合均匀； 2) 将步骤1)得到的混合物、油酸、甲醇改性复合体和改性添加剂混合均匀，制得生物燃油。 The method of the combination of more than one yuan biofuel formulation of claims 1 to 2 kinds 3.- Preparation claim, comprising: 1) a hydrophilic-lipophilic balance value of the surfactant is adjusted to 10 to 14, with methanol or ethanol, or after the mixture was fully mixed, and water; or a mixture thereof with methanol or ethanol mixed uniformly; 2) step 1) mixture, oleic acid, carbinol-modified and modifying additives composite obtained by mixing uniformly to prepare a biofuel. 4. 根据权利要求3所述的方法，其特征在于，所述的步骤2)还包括通过调节油酸和表面活性剂的比例来调节澄明度。 4. The method according to claim 3, wherein said step 2) further comprises adjusting the clarity of oleic and by adjusting the ratio of surfactant. 5. 根据权利要求3所述的方法，其特征在于，所述方法还包括向制得的生物燃油中加入石油磺酸钠和石油磺酸钡，使其酸度小于7mg KOH/lOOmL。 5. The method according to claim 3, characterized in that, said method further comprising the biofuel obtained oil was added petroleum sulfonate and barium sulfonate, it is less than the acidity 7mg KOH / lOOmL. 6. 根据权利要求3所述的方法，其特征在于，所述的步骤1)和步骤2)中的混合采用常温常压下混合或加温加压助反应；所述混合包括旋转式搅拌、周期性或切角随机的剪切式搅拌，以及外加磁激共振混合或反应压力混合；当使用外加反应压力混合时，反应压力不超过25MPa。 6. The method according to claim 3, characterized in that the mixture) in said step 1) and step 2 were mixed at room temperature using pressure or heat and pressure a reaction promoter; the mixing comprises rotating stirring, periodic or random chamfer shear stirring, and the applied magnetic resonances in a reaction pressure in the mixing or mixing; when used in a pressure applied to the reaction, the reaction pressure does not exceed 25MPa. 7. 权利要求1~2任一所述生物燃油和石化柴油或甲醇柴油混合制得的燃料油。 1 2 any one of the fuel and petrochemical diesel or bio-diesel fuel prepared by mixing methanol fuel oil as claimed in claim 7.